Annie’s birthday party was this past Saturday and I went all-out. I did something totally out of character and planned everything I wanted way in advance, and then I did a little bit of prep every night in the weeks leading up to the party. I am a lazy procrastinator when it comes to a lot of things, but when it comes to parties, mama don’t mess. The Yo Gabba Gabba theme was pretty fun and versatile; I took a lot of inspiration from songs from the show and used lyrics all over the place. Annie didn’t mind listening to the songs on repeat so I could get ideas. I hope you are ready for a mega-post. My awesome cousin Leah and her boyfriend Ted took turns with my camera, and they took five hundred photos. Literally. Thanks, you two! When guests walked in, they were prompted to take a hat and/or a pair of glasses. I bought the DJ Lance glasses from a party store, and I made the hats myself. Well, I bought the hats already made, but I pasted on the faces from a template I bought from an awesome website, ThePartyProject. I printed out her template onto large label paper, and then cut each face out by hand. The balloon wall was Annie’s favorite thing. I recruited my parents and Mike to blow up all these balloons (100 total) and then my dad and I tied them together into long strands. Mike hung them up on the wall while I put together the cardboard Plex and Foofa characters. When Annie walked out the morning of her party, she squealed with delight. I put together photobooth props (also from a template from ThePartyProject) so the guests could take pictures in front of the balloon wall. I set up my printer so anyone who took a picture with their camera phone could email it directly to the printer. Lots of people went home with pictures from the party! I put faces on the balloons, too. Of course I did. I printed off tons of stuff from the Nick Jr website to decorate the house, plus some of the other templates The Party Project sent me. I cut out so many things. My hands don’t want to use scissors for a while. You probably want to see the birthday girl. Annie Foofa! And of course, Brobee Heather and DJ Mike Rock in the house tonight! I went to the Nick Jr. website and printed up a bunch of YGG coloring sheets. I set up Annie’s table in the corner of her playroom and hung some ribbon on the wall with clothes pins so the kids could hang up their art. There was always at least two or three kids (big and small) coloring. We hired a balloon twister. This turned out to be a GREAT thing because it rained so the kids couldn’t run around outside. He made whatever the kids wanted – animals, hearts, flowers, and swords. Lots of swords. After an hour of ballon-twisting fun, it was time to sing happy birthday. Guess who didn’t cry? You can’t tell, but the 18 little kids behind me all helped Annie blow out her candles. There is nothing like the silence of a gaggle of children eating cake. Annie is still talking about the party. Yeah, I know it was only a few days ago, but it makes me happy to know that the hours of cutting and stringing and taping and pasting made an impact on her. After the party she said to me, “Mama! Gabba birthday SO FUN. Again?” Luckily for her, I am back to my lazy procrastinating ways, and the decorations are still on the walls. It’s Gabba birthday every day around here. Maybe that’s why she’s still talking about it? No One Disciplines MY Kid!No One Disciplines MY Kid! Totally fun party! It reminds me of when I did A’s 2nd birthday (Dora) and went all out. Aww, I miss it. Happy birthday, Annabel Annie Spohr! That party looks amazing, no wonder Annie is still talking about it! You better pace yourself, girlfriend! She’s got lots of birthdays to come and if you’re anything like me, you will want to out-do yourself each year. My daughter is now 18. and I am exhausted!!! Great job, Heather! AMAZING party Heather!!! You are soo much fun!!! 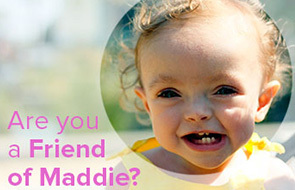 I must admit, I got a little teary when I saw the glasses on Maddie’s picture but I think it’s so AWESOME how you involved her too. I’m so happy Annie had the best time & it looks like you & Mike did too. Wishing you all more smiles, laughter & celebrations….b/c you my friends Deserve It!!!! I want you to plan “my” next birthday. How fun. Happy birthday to Annie! You are the best mommy!! How fun. I came to your blog by happenstance in 2008 and I’ve been nothing but inspired by you ever since! I never thought much about birthday parties until I saw how you’ve made your girls’ parties so unbelievably amazing and knew that I had to do the same. Now every year I get myself worked up, stressed out but in the end am very pleased, to throw my daughter a themed birthday party that she loves and talks about for days after and even a year later (she’s 4 1/2 years old)….thanks to YOU! I love, love, love your Yo Gabba Gabba Birthday theme for your Annabel — sheer PERFECTION!!!! You are amazing and it shows on the happy faces of those who were at the party and especially on your beautiful little girl’s face! Heather, do I have your permission to take a few of these Gabba party ideas?? My daughter will be 2 in May and we are having a Gabba themed party. I have a few ideas but yours are so great!! Sure! if you need any help, let me know! Holy. CRAP. That is amazing!!!!!!! Best birthday party ever!!! You could be a party planner! For real, what a cool party! Wow, you did an AMAZING job on this party- it looks like you had it professionally done! Annie is a lucky girl! I’m sorry to have missed that party because it looks like it was AWESOME. And thanks for the links to the Etsy seller and the How Does She site — I suspect I’ll be needing them for my own little one’s next birthday party. LOVE IT! So creative and adorable! Happy birthday again, Annie! Amazing, Heather! I love to go all out for my kids’ parties as well, but I’ve never seen a cooler party than Annie’s! I bet she loved loved loved it! One of my favorite quotes – “love is in the details”! Happy Birthday to sweet Annie! Love all the crafty things you came up with for YGG! Awesome party. I would totally still have all those awesome decorations up ; why squeeze just a little more joy out of all your hard work. Awesome party! You did a wonderful job! Can you be my Mommy?? Pleeeeeeeeeeeeeeeeeze???? So. AWESOME!! So cute. We had a Yo Gabba Gabba party for Mea’s third birthday. She also still talks about it. We had a CD with Gabba songs going through the whole party. I am pretty sure that you out YGG’ed me! Such cute ideas! That is excellent. Good job, Mama! Love, love, love, love. I always go all out for birthday parties, and sometimes I feel like people don’t get it. I love that you agree that our kids’ birth is worth going all out for!! The internet is so fabulous for finding ideas. Way to go Mama Spohr!! What an awesome party. Good job Mama! Wow! Way to go, Heather!! I’m already feeling bad for my daughter because she’ll probably never have a party like that. I am SO not creative or crafty! Guess I’ll just have to hire you:) Also love that you had a lot of healthy food options and not just a bunch of junk food! Well done. Absolutely, hands down, this is awesome! I LOVE the balloon wreath! I am a procrastinator too but this would be so cool to take on in little bits and pieces weeks before the event! Thanks, for all the great ideas! I may use them for my son’s birthday in July! He isn’t a Yo Gabba Gabba fan but he is a fan of Disney :). It could work!!! I am awed, because holy crap, that looks like an awful lot of work went into that. I bow down to your hostess skills. Catie’s birthday is on Friday, and we’re just farming it out to one of those giant bounce house places. All I have to do is order a cake. Laziness FTW! Seriously, looks like a fantastic party. Happy 2nd birthday to Annabel! I don’t really expect you to live up to the rules of this award, but I’ve left you one anyway at my blog. You are two of my favorite writers. Wow! You did an amazing job. What a great birthday party. Oh wow Heather! You could give Tori Spelling a run for her money with your party planning. You wow’d meh with your wreath…I luff it! Everything is just really really perfect! You certianly out did yourself!! It was a lot of fun. You can always count on me for ANYTHING!!! HAPPY BDAY ANNIE and Love you guys. Heather…. fun!!! you went all out! great job! love it!!! You are so creative! I love it! Um Wow. Is this normal for kid’s birthday parties in the US? You guys really go all out! A-MAZ-ING job! My little one is 4 months in 2 days and I can’t wait to plan these big, fun parties. My birthday is February 9. My hobbies are photography, baking, travel and foreign language. I will be earning my AAS in Baking Pastry Arts in May and I’ll probably go back for a degree in Graphic Design. Just telling you those things so that you can plan my birthday party. Little Miss Annabel: Happy Birthday 2 YOU! I’m exhausted just reading about this! That looks like it was an amazing party!! I never thought to go onto Nick Jr for ideas when my kiddos were younger! And I LOVE the coloring table, I think I might use it for my daughters party in a few months, she’s 8 and her and her little girlfriends still love to color and draw, great ideas!!! Will you be my mama!??? So impressive! Looks like Annie had the most amazing party! I think we are past Yo Gabba Gabba but if we were’t I would definitely ask if we could borrow some ideas. My favourite was your husband having the balls to wear a DJ Lance suit. No … my favourite was Gramma’s cucumber Brobee. No … it was Annie, pure and simple. She is SO BEAUTIFUL. Best parents ever. Also, you should wear those green fur things….with nothing else. Rawr. You’re welcome, Mike. I love, love, love it so very much! Makes “the turd cake” I unintentionally made my seven year old even more pathetic, which I didn’t think was possible. My birthday is Nov. 9th. I’ll be 34. Thanks in advance. Hey, I love your party idea for my niece. I REALLY REALLY want to know where you got those card board cutout of Plex and Foofa. Also, would you be interested in giving them away or selling them? Let me know, because my sister is really interested in those. July 10th. I like Hello Kitty. Happy Birthday Annie! Heather, I have one thing to say, you are AMAZING!!! love it and oh my gosh! She’s sooo big! Where has the time gone? That is so amazing!!! Awesome job!! Where did you get the grab bag boxes? They are fantastic! LOVE the balloon wreath! My daughter’s 4th birthday is next Wednesday, so hopefully I can get to a craft store before her party so I can get everything to make one! Annie looks like she had a great party! Thanks for the sharing! Annie’s yo! Gabba cabbage party looks a lot more put together than the one we threw for our son. Looks like everyone had fun! Very Nice! I really like the balloons. How did you put the Gabba faces on it? I printed the faces into adhesive-backed paper, then cut out each face and stucco them to helium balloons! What a fantastically creative job you did!! I have a 14 month old and we’ve now entered Yo Gabba Gabba land and I’m afraid I won’t be leaving here anytime soon so we might be doing this theme for his 2nd, so many great ideas, thanks!!! Oh my god. Biz’s Brie of the day. I wish you lived near me so we could be BFFs. I absolutely love everything Gabba you did! I’m laid off right now & I am planning my sons 2nd bday party which is gonna be Yo Gabba Gabba. you have the best website with the best ideas. I’m just now becoming crafty & my only question for you is. Wow, great party!!! I am also having a photo booth at my nephews 1st bday party and I can ‘t seem to find the templates for the props. If possible, can you send me the link on where I can get them from? Could you please tell me where you bought the favor boxes? I have the boombox artwork from the Gabba website but how did you find silver boxes to fit it? I am pretty sure I bought mine at birthdayexpress.com, but I just found them on sale here at costumeparty.com!